400 residents of RW 01, Ragunan, Pasar Minggu South Jakarta are participating in the Healthy Walk. It is held to celebrate the 73rd Independence Day.
" Especially today we have the Healthy Walk that is attended by 400 residents from RT 01 to 08"
RW 01 Chairman, Abdul Rohim stated that the event has been held since August 17. It is started with a flag ceremony followed by citizens, PKK members, and karang taruna youth organizations. It is continued with various competitions held at each RT on August 18. Then the event is held at RW level with Healthy Walk. "Especially today we have the Healthy Walk that is attended by 400 residents from RT 01 to 08," he expressed, Sunday (8/19). The peak of the event will fall on August 25 by holding entertainment stages filled by various entertainments from each RT. RW 01 LMK Member, Buchari Syamsi appreciates the event. It proves that citizens are still enthusiastic about welcoming the Independence Day every year. "I see the enthusiasm of the people is also quite good. This is once a year and it must be celebrated," he stated. Independence Day Event Chairperson, Indah Nuansa Bukusu explained that the event was participated by children until seniors. His side prepares 40 dooprizes for the winner. "All of this is from self-help citizens. 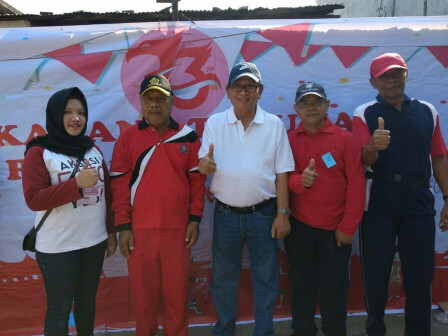 We also hold traditional games returns competitions such as congklak (mancala-based wooden board game), bakiak (a group of people walking in pairs of tandem wooden clogs), and sack racing," he said.